Last year, I offered a smoky take on the classic Waldorf Salad, a good way to make the warm-weather staple into a winter dish. This year, I'm steering it toward a brighter course idea for the fresh flavors of spring. The tweaks are actually pretty minimal. Tangier (and lower calorie) Greek yogurt stands in for the mayonnaise, while lemon juice and fresh mint contribute their sunny notes. 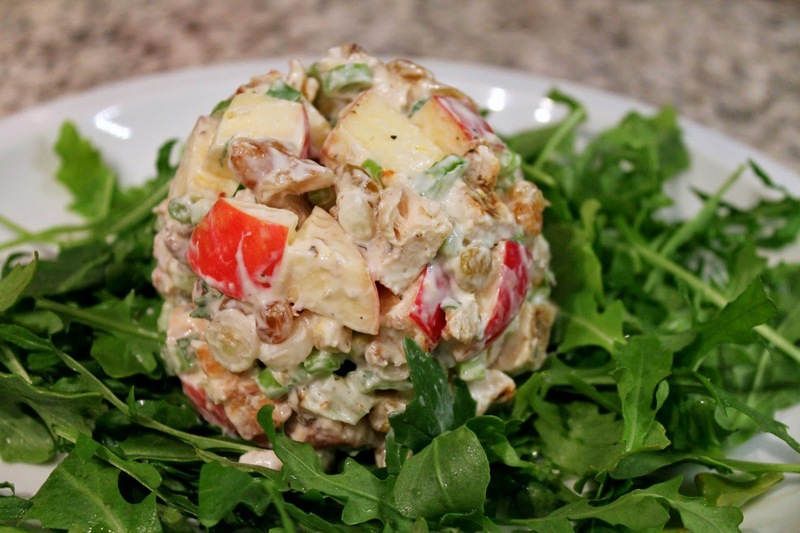 Otherwise this is pretty typical Waldorf salad with chicken, celery, apples, walnuts or raisins (you may use halved grapes instead if you like). 1. Heat olive oil in a medium pan over medium heat. Pat chicken breasts dry with a paper towel, season with salt and pepper and add to hot pan. Cook for about 10 minutes, flipping over halfway, until lightly browned and cooked through. Allow to cool, transfer to a cutting board and chop into pieces about 1/2 to 1 inch wide. 2. In a large bowl, combine chicken, apple, celery, scallions, walnuts and raisins. Whisk together yogurt, lemon zest, lemon juice and mint. Add dressing to ingredients in bowl and toss to combine. Serve in individual servings over arugula leaves.